"Idle Talk or Gospel Truth?" During Holy Week, we heard the powerful story of how Jesus offered his life in the ultimate act of sacrificial love and was crucified on the cross. The women who had followed Jesus from Galilee to Jerusalem had watched as the body of Jesus was taken down from the cross. They watched as Joseph of Arimithea took the body, wrapped it in linen, and placed it in a nearby tomb… and sealed in with a big stone that was rolled against the opening. They went home to prepare spices that would be needed to complete the proper burial of the body. There wasn’t time to finish preparing Jesus’ body for burial before the Sabbath began, so in the darkness, just before sunrise on the day after the Sabbath, the women head back to the tomb, bringing the spices and ointments they need to finish preparing Jesus’ body for burial. “Why do you seek the living among the dead?” The women came to the tomb expecting to find the dead. But this tomb is now empty, transformed by the resurrection. Apparently, then, the women do remember. They run back to tell the rest of the disciples what they have seen and heard. But the other disciples don’t believe them. The news seems to them an “idle tale.” Actually, as David Lose points out, that’s a fairly generous translation of the Greek word leros, which is the root of the word “delirious.” So, it seems they thought what the women were saying was crazy—utter nonsense. And, if we’re to be honest, who can blame them? Dead men don’t just get up and walk out of their tombs. Resurrection breaks all the old, familiar rules that help us to understand how things work in the world. Then-- as now-- we often don’t know how to respond to the unexpected… things that don’t fall neatly into our preconceived ways of thinking. So, Peter gets up and runs to the tomb to check things out for himself. He stoops down and looks in, and he sees the linen grave cloths lying there empty. Then he heads for home, amazed at what had happened. The first disciples were reeling with grief. Their beloved friend, their leader-- the one person on whom they had staked everything, had just been tortured and killed. Now his body had disappeared. Everything that was happening that first Easter was new… unfamiliar…strange. It was hard to take it all in. Each of the gospels makes it clear that the disciples didn’t come quickly to believe in the resurrection. They respond with a mixture of emotions: fear…great joy…amazement…and doubt. It takes more than an empty tomb for the disciples to understand and to become believers. And yet the disciples do follow Jesus after the resurrection. Some even follow him to their own deaths. The tomb is empty, and Christ is risen. Death does not have the final word. Love and life are stronger than fear and death. Everything is new. Anything is possible with God. This was a perplexing new reality. But they follow in faith--without fully grasping the meaning of it all. Isn’t that what a lot of us do? You and I may not fully understand what happened on that first Easter Sunday long ago. That’s why we call it a mystery! Yet every now and then, if only for a fleeting moment, Jesus is especially alive and real to us. In the coming weeks we’ll hear some of the stories about how the Risen Christ appeared to his disciples. They recognize him as the Risen Christ. Then he vanishes from their sight. It’s a pattern that’s common in the resurrection stories. Jesus is there. Then he’s gone. Though they experience his presence, they can’t grab on to him and keep him there. But they come to know the Risen Christ in powerful ways in their daily lives and work. It was not at the empty tomb that these people came to know the Risen Christ. It was as they sought to follow him--as they experienced his power and love in their lives and among the community of faith-- that they knew his presence. As they followed the Risen Christ, they were transformed into Easter people! In the days following Jesus’ crucifixion, the first disciples were huddled behind locked doors, trembling in fear. But over time, they were transformed and empowered to witness to the Gospel. In the early days of the church growing numbers of people came together for prayer and to study the scriptures and became more and more generous and loving in their relationship with others. People looked at Christians and exclaimed, “See how they love one another! See how joyful they are!” And they wanted to be a part of that movement. Even though, in the earliest centuries of the church, following Christ could bring persecution, the church grew like wildfire and transformed the world. Easter is perplexing. But Easter isn’t just about saying we believe in the resurrection. Easter is about saying “no” to the power of death and destruction that surrounds us. It’s about trusting in the sustaining power of God, who brings life out of death…and reconciliation out of conflict, as the scriptures tell us. It’s about committing ourselves to the gospel claim that opens the door to new life—for ourselves and for acts of love and reconciliation in the world. Our Holy Week journey moves us from pain and suffering of Jesus and the pain and suffering in the world-- to hope. We see the continuing open wounds of structural racism, patriarchy, and other forms of oppression and injustice. We see Islamophobia, anti-Semitism, Nativism, and other forms of hatred practiced more virulently and openly than at any time in recent memory. Every day we get more scientific information that shows us that we’re running out of time to avoid the most catastrophic levels of climate change. We also see crowd-funding campaigns for people trying to pay for medical procedures or even basic maintenance medications like insulin and hear stories of people who died because they couldn’t afford the treatment they needed. This week, we observed the twentieth anniversary of the Columbine School massacre and mourn that the United States now averages nearly one mass shooting a day. In one of the richest countries of the world, we don’t seem to have the political will to address the unjust policies that support growing income inequity and cruel immigration policies. Easter is a reminder every year that pain and loss and death don’t have the final word. The resurrection of Jesus Christ teaches us that there always is and always will be hope. The first disciples went to the tomb that first Easter looking for a dead Messiah. But what they found was an empty tomb. They were confused and fearful. But within a few days, the followers of Jesus were telling the world that Christ, the King of Love, was alive and making all things new. 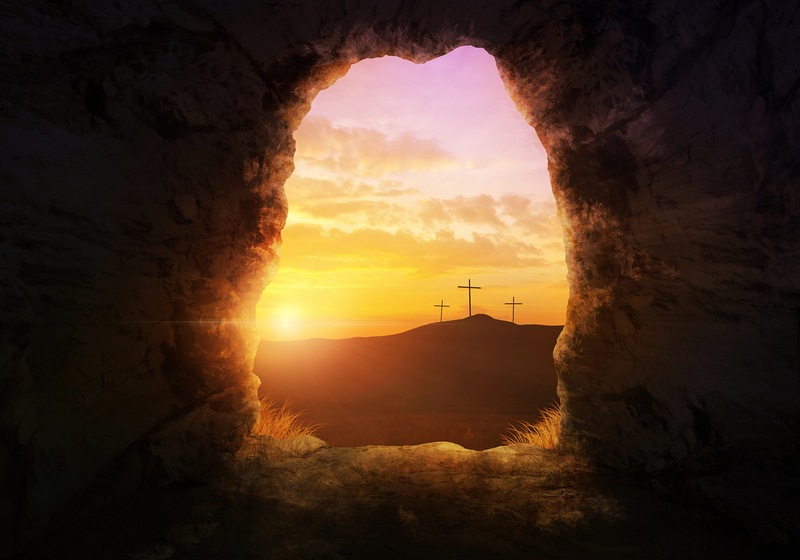 We have come to the tomb and found it empty. Like those first disciples, we have been given a mission and a message to tell the others. We, too, need to look beyond the empty tomb... and trust God to show us the risen and living Savior and the new life to which we are called. Like those first disciples, we are witnesses of amazing things. So-- what do we do about that? Tune in-- same time, same place-- next Sunday and the following Sundays, as we discover together more about what it means to be God's Easter people in this new time. Easter isn't over at the end of Easter Sunday. This is the beginning of Easter-tide, the season when we are led further into God's truth for God's Easter people…further into God’s new creation. Every act of love, every deed done in the name of Christ, by the power of the Spirit… every work of true creativity—healing families, doing justice, making peace, seeking and winning true freedom—is an earthly event in a long history of things that carry the resurrection out into the world and anticipate the final new creation. The good news for us today is that when we gather in Christ's name, Christ will be with us, calling us into to hope and wholeness and freedom. “A Brief Statement of Faith.” Presbyterian Church (USA), 1990. "God's Revolution of Love." An Introductory Meditation on the Palm and Passion Sunday scripture texts. 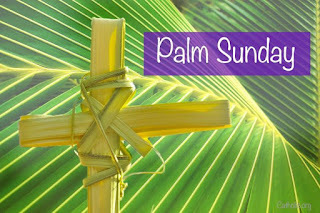 An Introductory Meditation on Palm and Passion Sunday"
A few minutes ago, we heard the story how Jesus entered into Jerusalem on the back of a donkey on that first Palm Sunday, in a dramatic act of subversive political theater. Jesus enters into Jerusalem like a king, challenging the authority of every earthly kind and even of Caesar himself. Can you imagine what this must have been like for Jesus’ disciples? Jesus had told them what to expect. Three times he had said plainly, “We are going up to Jerusalem, and everything that is written by the prophets about the Son of Man will be fulfilled. He will be delivered over to the Gentiles. They will mock him, insult him, and spit on him. They will flog him and kill him. On the third day, he will rise again.” But I doubt they understood fully what they would witness later in the week. There are layers of subversion in today’s scripture readings. Psalm 118 is a psalm of Passover, of escape from slavery. It’s a psalm of liberation from oppression. It celebrates God’s empowerment of people who were once exploited and dehumanized. It praises the complete upending of power structures that enrich a dominant ruler or class at the expense of those who are exploited and marginalized. The crowd comes out joyfully to meet Jesus, strewing their palm branches and spreading their cloaks on the road. They pour into the street to welcome their king, riding on a young donkey—a beast of burden. The story of Palm Sunday, as Luke tells it, draws on Old Testament prophecies to show Jesus as a messianic king. Six centuries earlier, the prophet Zechariah had proclaimed a messianic vision of a king like David returning to the throne in Jerusalem, and Luke uses this imagery in describing Jesus’ procession into Jerusalem. Zechariah says, “Lo, your king comes to you, triumphant and victorious is he, humble and riding on a donkey, on a colt, the foal of a donkey. The people would have recognized this imagery. So, when Jesus came riding into Jerusalem, it must have felt to the peasants in the crowd as though they were on the threshold of an exciting new era. By entering Jerusalem in this way, Jesus claims to be the legitimate king. This is a counter-demonstration that challenges the authority of imperial rule over Jerusalem. Jesus’s procession embodied an alternative vision-- the kingdom of God. His victory will be won through humility and nonviolence and love. Jesus’ humble claim to a peaceful kingship was radically counter-cultural. It was politically subversive. This contrast— between the kingdom of God and the kingdom of Caesar— is central to the gospel story-- to the story of Jesus and the early church. According to Luke’s Gospel, Jesus returned to the Temple on the following day to overturn the tables and cast out the money changers, protesting the Temple’s collaboration with an Empire that enriched the few and oppressed the many. In a few moments, we are going to hear the story of Christ's Passion, as told by Luke. Today and this Holy Week, may we be startled and challenged into seeing God’s Reign afresh, as the subversive, empire-challenging reality that it is. "An Extravagant Love." A Sermon on John 12:1-8 from Littlefield Presbyterian Church on the 5th Sunday in Lent. In the previous chapter of John’s gospel, Lazarus was very ill, and his sisters Mary and Martha had sent a message to Jesus. Though Jesus loved Martha and Mary and Lazarus, he stayed two days longer in the place where he was, before he headed to Bethany. When he got there, Lazarus had already been in the tomb for four days, and the mourners were there to console Mary and Martha. So, that’s the context. Now, six days before the Passover, Jesus comes to Bethany, to the home of Lazarus. Once again, the house is filled with family and friends, and the table is covered with food. Martha is hard at work serving. Lazarus is reclining with Jesus-- Lazarus who was in the tomb until Jesus called him out. In a room full of men, Mary loosens her hair-- which is something a respectable woman never did in that culture. She pours balm on Jesus' feet, which also is not done. Then she touches him-- a single woman caressing the feet of a rabbi. Also, not done, not even among friends. Then she wipes the salve off again-- with her hair. It is totally inexplicable-- the bizarre end to an all-around bizarre act. Judas is quick to point out how extravagant Mary’s action is. "Why wasn't this ointment sold for three hundred denarii and the money given to the poor?" That's what Judas wants to know. A day laborer and his family could live on that much money for a year, and here she has poured it all out on your feet!" But Jesus doesn’t see it that way. "Leave her alone,” Jesus says, brushing all objections aside. "She bought it so that she might keep it for the day of my burial. You always have the poor with you, but you do not always have me." Now, that is about as odd a thing to say as anything Mary did. Jesus, who was always concerned about the needs of the poor and marginalized and putting their needs ahead of his own, suddenly pulling rank. Leave her alone. You will have the poor to look after until the end of time. Just this once, let her look after me, because my time is running out. The poor you always have with you. These words of Jesus have often been interpreted to mean that Jesus believed poverty is inevitable. As the Rev. 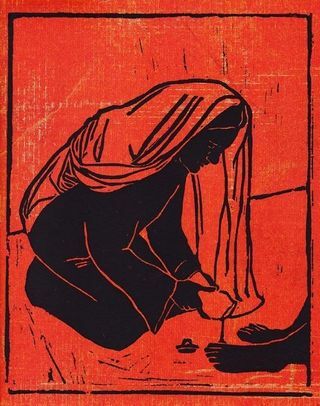 Dr. Liz Theoharis suggested in the book we read for our Lenten study last year, some people see poverty as an individual issue. Some believe that poverty is a matter of individual sin or moral failure—that people are poor because they don’t work hard enough…or have made bad choices. In her book, Liz seeks to show that--far from giving Christian reason to ignore calls for economic justice, the passage we heard today actually makes “one of the strongest statements of the biblical mandate to end poverty.” She says the passage has been twisted out of context to justify the belief that poverty as inevitable. “The poor you always have with you, but you will not always have me.” Some people would argue from this that we should attend to spiritual needs over, or instead of, tangible human needs. “Just a closer walk thee,” instead of a march on Washington. Thoughts and prayers, rather than votes and legislation. Individual acts of kindness, but keep the church out of the realm of policy-making and community activism. But there are problems with this interpretation. As biblical scholar Lindsey Trozzo writes, we can’t separate Jesus from the poor. Jesus brought good news in tangible ways to those who were oppressed and vulnerable, and in his actions and teaching he challenged the oppressive political system of his day. Going back to the story: Jesus and the disciples and some close friends are eating dinner, when Mary brings in a pound of expensive perfume and pours the perfume on Jesus’ feet. This is an anointing scene. In ancient Palestine, there were two events that would call for an anointing: a coronation and a burial. Jesus is about to die. He is going away, but the poor are always with you. Keep the poor among you always. So, could it be, as Trozzo suggests, that this passage that has been used to justify disregard for the poor is actually a direct command to always have Jesus’ mission for and among the poor at the center of our mission? Jesus’ words about the poor echo Deuteronomy 15:11: “There will never cease to be some in need on the earth. Since there will never cease to be some in need on the earth…. I therefore command you, ‘Open your hand to the poor and needy neighbor in your land.’” The 15th chapter of Deuteronomy outlines the practice of a Sabbatical year in Israel’s tradition. Every seventh year, the people were instructed to forgive all debts. They were also instructed to give generously to the poor in other years. Also, every 50th year, they were to have a year of Jubilee, which called for even greater generosity and debt forgiveness, and release for those who were enslaved. The context reminds us that Jesus’ teachings about the poor is a charge to live according to a different value system, and to work toward systematic change that would include all persons in a community of justice and abundance. We live in the tension between the reality that poverty is part of the way our world works today—and the hope of God’s beloved community, where no one suffers from poverty. While Mary’s behavior may have seemed strange to those who were gathered in the house that night, it was no stranger than that of the prophets who went before her. Ezekiel, who ate the scroll of the Lord as a sign that he carried the word of God around inside of him. Jeremiah, who smashed the clay jar to show God's judgment on Judah and Jerusalem. Isaiah, who walked around Jerusalem naked and barefoot as an oracle against the nations. Prophets do these things. They act out the truth that no one else can see. Those who stand around watching either write them off as crazy... or fall silent before the disturbing news they bring from God. When Mary stood before Jesus with that pound of pure nard, it probably could have gone either way. She could have anointed his head and everyone there could have proclaimed him a king. But she didn't do that. When she moved toward him, she dropped to her knees and poured the salve on his feet, anointing him for his death. This was the action of a faithful disciple. 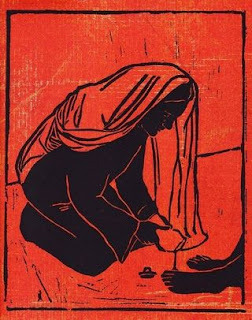 Jesus received from Mary what he would soon offer to his disciples, wiping his feet with her hair, as Jesus will wipe his disciples’ feet with a towel. Mary anointed Jesus’ feet with ointment so precious that its sale might have fed a poor family for a year. Mary’s act was an extravagant act of love, a model of faithful discipleship—in contrast to Judas’s unfaithful response. In the story, Judas represents the voice of reason and practicality. I think this story invites us to identify not just with Mary or Judas. In the figure of Mary, Christian discipleship is an act of adoration and gratitude to the One who is holy. In her silent, prophetic act, she draws our attention not to herself--but to Jesus. The good news is the grace of Jesus Christ includes them both, both the faithful and the unfaithful. Both are included within the bright, transforming light the cross casts in a dark world. How do we respond to Jesus’ self-emptying, extravagant love? With a calculating, practical, careful way of life, like Judas? Or does Christ call us to live lives of extravagant love? Over history there have been other fools for Christ: Saint Francis, giving up his material wealth, living among the poor. Dietrich Bonhoeffer returning to Germany and witnessing to his faith, eventually dying for it, rather than staying safely in New York. Desmond Tutu, challenging the powers that be, when he knew it could cost him. Fools for Christ do not live a careful, calculating life-- but an abundant, extravagantly loving life. Mary’s love was uncalculating. She was too caught up in her love and gratitude for Jesus to be concerned with her own scandalous behavior and extravagance. Jesus said, I came that they might have life—life abundant. We are called to a life of extravagant faithfulness. If we follow Christ, we will not calculate what is easiest or what will look best. If we follow Christ, we will not be stingy or calculating. Mary showed us that she was beginning to understand that we don't need to hold back, out of fear. Whatever we need, there will be enough to go around, for there is nothing frugal about the love of God, or about the lives of those who are devoted to him. Where God is concerned, there is always more-- more than we can either ask or imagine-- gifts from our gracious, extravagant Lord." "A God Who Never Gives Up On Us." A Sermon on Luke 15 on the Fourth Sunday in Lent. 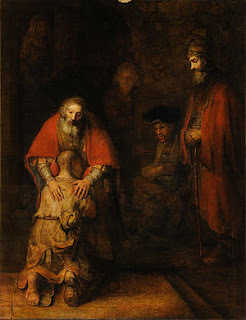 Rembrandt, "Return of the Prodigal Son"
"A God Who Never Gives Up On Us"
“There was a man who had two sons,” we hear in today’s Gospel lesson. We immediately recognize this as the beginning of the prodigal son, so there’s a temptation to decide that we don’t have to pay much attention, because we think we already know the story and its meaning. But when we really listen to it, scripture can surprise us. This is word of God. When we read it afresh, God speaks to us and our circumstances, and helps us to hear a new word. The story we know as the “Parable of the Prodigal Son” is one of three parables Jesus tells in Luke 15. The thing the three stories have in common is the theme of being lost. The shepherd loses a sheep, a woman loses a coin, and the father loses a son. The introduction provides the context of the stories. They’re a response to how the Pharisees and scribes have been grumbling and criticizing Jesus, saying, “This man welcomes sinners and even eats with them!” The parable is responding to the Pharisees and scribes—not primarily to those whom they consider sinners or outcasts. Jesus doesn't argue with them. He just tells them a series of stories, about a shepherd who leaves ninety-nine sheep to fend for themselves while he went out after one stray... about a woman who turns her house upside down in order to find one lost coin... and about a compassionate father who deals graciously with his two sons. Now, I want to remind us that the Pharisees and scribes were deeply religious people. They were very concerned with obeying God and all the religious laws of Judaism. From their perspective, it was those other people—the tax collectors and sinners—who were lost. They were unlikely to identify themselves with the lost sheep or the lost son. They were more likely to identify with the ninety-nine sheep or the obedient elder son. So, they probably would have been shocked to hear in the story that the shepherd leaves the ninety-nine sheep to go searching for the one lost sheep…or to see the elder son missing the feast celebrating his brother’s return. These parables would have challenged their understanding that they were the faithful, obedient ones. All three stories address the Pharisees' concern that Jesus is condoning sin by keeping company with people they judge to be unacceptable. All three parables reply that God is too busy rejoicing over found sheep, found coins, and lost children to worry about what they did while they were lost. I was reminded this week of Rembrandt’s painting, “The Return of the Prodigal Son,” and I spent some time meditating on that image. I also re-read parts of Henri Nouwen’s book with the same title. Nouwen tells about his first encounter with the painting when he saw a poster in a friend’s office, and was deeply moved by it. He said it made him want to cry and laugh at the same time. Several years later, friends invited him to go with them on a trip to what was then the Soviet Union, and they made arrangements for him to spend a few hours at the Hermitage in Saint Petersburg with the painting that been on his heart and mind for several years. The painting is hung in the natural light of a nearby window. In the hours Nouwen studied it, the light kept changing, and at every change of the light, he would see a different aspect revealed. I think Nouwen’s discovery in this painting points us to the amazing gift this parable is to us. No matter how often we hear it, there is always a new angle or perspective, a new revelation. I think it would good for us to listen to the parable of the two sons, to meditate on it a few more times this Lent, and to try moving back and forth between seeing ourselves as the lost son who is welcomed home with open arms… and the obedient elder brother who apparently thinks he is more deserving. Lent is a good time to ponder both the grace of the God who seeks us and refuses to give up on us and welcomes us home and also the temptation that religious people face, when we think that we are better or more faithful than those other people. Scholars tell us that the younger of two brothers would have expected to inherit a third of the father’s property when he died. Kenneth Bailey explains that the son asks not only for the division of the inheritance, but also for the right to dispose of his part. Even after dividing the property and signing over his possessions to his son, normally the father still would have the right to live off the proceeds…as long as he is alive. But this son lets his father know that he can’t wait for him to die, and demands his money, which would have meant his father would have needed to sell off a third of the family estate. The son’s leaving is a rejection of his home and the values of his family and community. He leaves everything to go to a “distant country.” He squanders his property in self-indulgent, immoral living. Then there was a severe famine, and he began to be in need. He was so desperate that he—this Jewish boy—hired himself out to take care of pigs. As he trudges along the dusty road toward home, he rehearses what he'll say to his father: "Father, I have sinned against heaven and before you. I am no longer worthy to be called your son. So, treat me like one of your hired hands." Meanwhile, back at home, the father has been scanning the horizon, longing to see his son and welcome him home. When he sees his beloved lost son trudging home, the father is filled with compassion. He does a very un-dignified thing. He hikes up his robes and runs to meet him. When he reaches his son, he throws his arms around him and kisses him, before the son has a chance to say anything. The son starts to apologize: "Father, I have sinned against heaven and before you. I am no longer worthy to be called your son." Before he can say any more, the father says to his servants, "Hurry-- bring out a robe-- the best one-- and put it on him. Put a ring on his finger and sandals on his feet." In doing this, he shows that he's welcoming his son back as a son, rather than as a servant. The son must have been speechless with astonishment. But the father isn't through yet. "Kill the fatted calf," he orders. "We're going to have a feast and celebrate, for this son of mine was dead and is alive again. He was lost-- and now he's found!" The household bursts into activity, and soon a joyous feast is underway. The younger son never dreamed that his father loved him so deeply. There were no "I told you so's." This son's life was far more precious to the father than being right, or putting his son in his place. The younger son finally saw deep into his father's heart that day-- and what he saw was pure love. When the elder son gets back from work, he’s surprised to hear music and dancing. "What's going on?" he asks one of the servants. The servant tells him, "Your brother has come home, and your father has killed the fatted calf, because he has got him back safe and sound." The elder brother refuses to go in to the party. Luke doesn't tell us why, but my hunch is that he wasn't angry because his younger brother came back. Maybe he wasn't even angry because his father forgave him. But the party-- that was another matter. Let the sinners come home, by all means. But what about facing the consequences of your actions? Where's the moral instruction in that kind of welcome? What kind of a world would this be, if we all made a practice of having a party for sinners, while the dutiful, obedient folk are still working in the fields? His father comes out and begins to plead with him. "Your brother has come home, son. He was lost and now he is found. Come in to the party and celebrate with us!" Do you hear how he answers his father? "Listen!" he says. "For all these years I have been working like a slave for you, and I have never disobeyed your command! I've done my duty and followed all your rules. Yet you have never given me even a young goat so that I might celebrate with my friends. But when this son of yours came back, who has devoured your property with prostitutes, you killed the fatted calf for him!" God help him, the elder son. God help all of us who understand his hurt and resentment that run so deep that we cut ourselves off from the very ones whose love and acceptance we so desperately need. "This son of yours,” the elder brother says, excluding himself from the family in those words. This son of yours, who is no kin to me. The older son believes his father has chosen the younger brother over him. The father knows that he has lost this son to a life of self-righteousness and resentment that takes him so far away from his father that he might as well be away in a far country. The elder son wants his father to love him as he thinks he deserves to be loved-- because he has stayed home and done the right thing-- the dutiful thing. He wants his father to love him for all of that. His father does love him, but not for any of that-- any more than he loves the younger brother for what he has done. He doesn't love either of his sons according to what they deserve. He just loves them. But the dutiful older brother can't comprehend a love that transcends right and wrong... a love that throws homecoming parties for sinners and expects the hard-working righteous people to rejoice. He can't stand it, and so he stands outside. Outside his father's house and his father's love-- refusing his invitation to come inside to the party. But his father turns out to be a prodigal, too-- at least as far as his love is concerned. He never seems to tire of giving it away. "Son," he says, “you are always with me. All that is mine is yours." "It was necessary that we celebrate and be glad," the loving father says to his older son, “for this your brother"-- not just my son, but your brother--” was dead, and is alive. He was lost and is found." I don’t think Jesus is telling us that we shouldn’t take sin seriously. Our Reformed faith teaches us that we are all sinners. But I believe Jesus is showing us that we need to take GRACE seriously. It is by God’s grace that we are all beloved children of God. It is by grace that each one of us receives not the love we deserve—but the love God wants to give us. Whether we see ourselves more like the older brother or the younger brother, we can rejoice because God loves us all abundantly, out of God’s grace. The parable doesn't tell us how it all turned out. The story ends with the elder brother standing outside the house in the yard with his father, listening to the party going on inside. Jesus leaves it that way, I think, because it's up to each of us to finish the story. It's up to you and to me to decide. Will we stand outside the celebration of love and grace? Or will our yearning for love win us over? We're invited to go inside and join the party. Like the loving father in the story, God refuses to give us the love we deserve... but persists in giving us the love we need… and rejoices over the return of every lost child. Thanks be to God for God’s amazing grace! Rembrandt Harmenszoon van Rijn, 1606-1669. “Return of the Prodigal Son,” and oil painting likely completed within two years of the artist’s death in 1669. The original is in the Hermitage, Museum in Saint Petersburg. Henri J. M. Nouwen, The Return of the Prodigal Son: A Story of Homecoming. Doubleday, 1992. Kenneth E. Bailey, quoted in Nouwen, Location 449 in Kindle Edition.